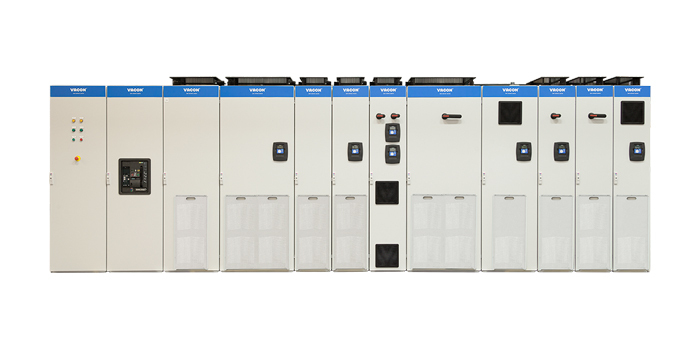 The VACON® NXP System Drive is a comprehensive configured common DC bus drive line up for heavy-industry needs where round-the-clock activity is required leaving little time for maintenance. All sections are grouped depending on their functionality, making it possible to plan each installation phase according to your requirements. The engineered sections slot in alongside each other allowing you to arrange integrated transport splits to save space. Alternatively, you can add extra transport sections to speed up installation. All larger modules have slide-out mechanics for easier set-up and maintenance. The VACON NXP System Drive is built to last. Items such as busbar systems and high/low power devices are separated into individual compartments away from each other. This means that, if an issue occurs, it is compartmentalized and doesn’t cause widespread failure helping to reduce lifetime and maintenance costs. Metal lines, continuous web systems, winders and unwinders, crane systems, winches and conveyors.